Llanoddian Isaf Holiday Cottages01938 810324work Self-cateringEleri and Gwynne welcome you to Llanoddian Isaf Cottages, two beautifu five star self-catering holiday cottages set on a smallholding in the rural Welsh countryside. 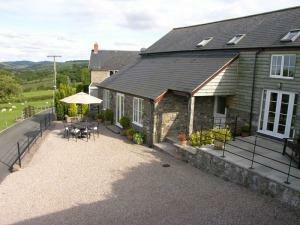 If you are looking for a relaxing, fun Mid Wales self-catering holiday in a beautiful location, look no further. Our luxurious, five star holiday cottages are the ideal choice for families, couples or friends who want a self-catering holiday they wont forget. The self-catering cottages, Y Beudy and Ysgubor, are set back from a quiet lane on a smallholding in Dolanog, near Welshpool. ‘Peaceful’, ‘tranquil’ and ‘idyllic’ are just some of the words our guests have used to describe their Mid Wales self-catering holiday, and it’s easy to see why: with stunning views, a quiet broken only by the bleating of sheep and their new born lambs and 24 acres of private farmland to stroll round, Llanoddian Cottages are the perfect, blissful holiday escape. The holiday cottages are also ideally situated for a Mid Wales holiday, as they are central to the area: a number of scenic walks, including the famous Offa’s Dyke and Glyndwr Way, are easily accessible, as well as a selection of picturesque market towns with an array of shops and restaurants. Eleri and Gwynne have lived in the area all their lives, and are more than willing to share their knowledge about the best places to visit, eat, shop and walk. They love welcoming guests to the holiday cottages, and always go the extra mile to ensure guests have a fabulous Mid Wales self-catering holiday. It’s their warm welcome, the fantastic self-catering accommodation and the beautiful location that keep guests coming back year after year. Please take a look around our site, browse our beautiful pictures and see why Llanoddian Isaf Cottages are the perfect choice for your Mid Wales self-catering holiday. Eleri and Gwynne welcome you to Llanoddian Isaf Cottages, two beautifu five star self-catering holiday cottages set on a smallholding in the rural Welsh countryside. -Turn right for Llanoddian Isaf, then 1st right for Ysgubor and Y Beudy onto a tarmac drive,then turn 1st on the left for Ysgubor cottage onto a stone parking area. -Up two steps onto a covered area, 1 step into a spacious light hallway. -2 steps down into a spacious kitchen, dinning room and sitting room with patio doors leading down 1 step onto a parking area. -Leading out of the hallway 2 large steps up into the 2nd lounge, with 1 step out onto the patio area with garden furniture. Level 2 -Leading out of the hallway up 6 steps,turn left along the hall,then up 6 steps into 1 large double bedroom and 1 bunk bedded room, with a shared ensuite. -Bedroom 3, twinbedded room with ensuite bathroom on right hand side of hallway, with another 3 steps.